Bulldog Francese stile di un GLITTER DECORAZIONE DI NATALE - 10 scelte di colore. Beautiful Christmas decoration made from 3mm mirror acrylic. This is a beautiful gift. Baby's First Christmas Tree Decoration. FOTO personalizzata albero di Natale Decorazione Foto-Regalo Ideale BIADESIVO! NOW Double sided Printing! Photograph on one side wording on the reverse. Personalised with your chosen photograph and text if required. We may need to crop photographs in order maintain the best aspect of the subject within the printing area. Chihuahua stile B GLITTER DECORAZIONE DI NATALE - 10 scelte di colore. By Gisela Graham. 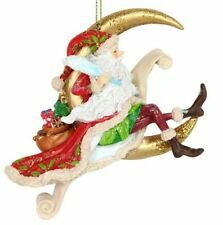 Lovely Santa on Moon. 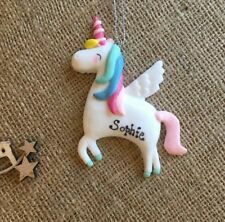 A wonderful sparkly personalised unicorn decoration. Great as a Christmas decoration or party favour for guests at a birthday party. They also make a lovely gift and keepsake. It has colourful embellishment and pink tail detail. Each measures approx 8x8cm. please remember to leave a message to seller with the name you need on the item. Lots more personalised items can be found in my shop. Thanks for looking. Beautiful Dove design tree decoration. TREE DECORATION. Spruce up your tree with this lovely elegant decoration. Whilst every effort is taken to ensure the colour of the product in the photographic image appears as accurate as possible there may be slight differences due to the fact that the photographic image does not always truly reflect the exact colour of the item. Please take a look at my other items. I am happy to combine postage where possible so please contact me and I will try my best to help. Thank you for looking! Wings Plain Bauble. LASER CUT MDF. All the timber we use carries the FSC trademark. Click here to see description. 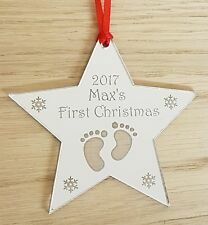 Ha ndwritten on the heart is " Sara & Tom's 1st Christmas Together Forever 2016" decorated with a christmas design button which may differ from one shown in image and finished off with a silver organza and silver polka dots on the heart. Christmas Tree Bauble Decoration. Cream/Gold/Silver Glitter. Christmas Baubles. Six Baubles in a Box. Donna delle pulizie feltro omino pan di zenzero Decorazioni di Natale. Mrs Mop pulitore regalo regalo. San VALENTINO IN PIZZO INTIMO BURLESQUE Decorazione Di Natale Decorazione del modello di glamour. BULL TERRIER in MINIATURA stile di un GLITTER DECORAZIONE DI NATALE - 10 scelte di colore. These Christmas baubles will add style to any Christmas tree. Design: Box of 14 Reindeer design Baubles in matching Gift Box (see picture). Purchasing - You are purchasing 1 box of 14 baubles of the design pictured in a gift box. Bulldog Stile un GLITTER DECORAZIONE DI NATALE - 10 scelte di colore.